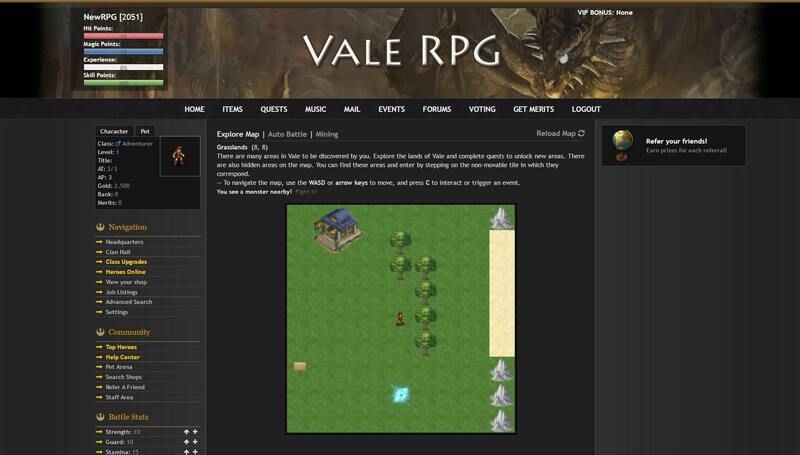 Vale RPG is a free fantasy-based browser game. Use arrows for moving, press C letter to talk to someone and X for fighting. You can train your stats like strength, guard, HP and MP. Keep an eye on your items in shop but you must buy a shop first. Send an application to join a clan, attack pets or work enough to reach rankings. Hall of Fame includes players who have highest level, highest mana, highest losses etc. Choose your class and upgrade him. Very nice and retro rpg. Very challenging at times. I luv it sooo much! Very fun game with tremendous potential, needs (and keeps) growing, updating and evolving. Active and helpful Mods, friendly community. When I found Vale, I couldn’t believe my eyes. This is truly the best game I’ve played in a long time. It’s dipped in popularity but unrightfully so; it is a gem of its genre and deserves to be played more. Thanks Vale creators! I love this game it is very fun. This game is very well made. The staff is attentive and the players are helpful. You are encouraged to play it feels like meeting with friends you already know. Nice game keep it up! Nice game, allows you to play without devoting a ton of time if you are looking for a more idle play. nice game….similiar to Samurai of Legends but much better in graphics! Laid back nature of this game makes it AWESOME!!! Awesome, and addictive. 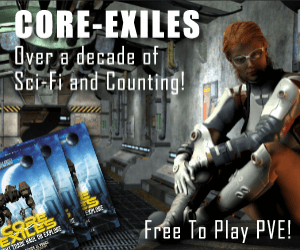 If you like RPGs, PBBs, or the Final Fantasy franchise, check it out! Funny game with intuitive mechanics. Pick a class, battle mobs, gain EXP and LVLs to increase your stats so you can fight harder mobs, Vale also has some other systems like fishing, mining and farming ! A whole map, creatures and equipments/weapons to discover by rising levels. A supporting staff that keep the game constatly updated. All in your browser and available at smartphones. Totally suggested. Nice game to play while watching netflix 🙂 regular rpg with leveling,stats allocation class upgrade and pets and pvp arena,mining,fishing and cultivating crops,you can’t move with arrows you move by clicking on different zones,progression is done with a timer,simple and fun overall to pass some time. Sehr schönes Spiel das man praktisch überall spielen kann. Die Comunity ist nett, der Entwickler hilft und geht auf die Spieler ein. Kein Spiel vor den man stundenlang sitzen kann, aber für Nebenbei absolut tauglich. Mir gefällt es sehr gut, andere mögen da andere Ansprüche haben. Fun game, simple and easy to play. Good to burn some time. Only just started and after I ran outta energy I got a little ragey. My recommendation is to definitely make sure you look at the help link before you do too much spending. Otherwise its a fairly fun game once you figure everything out and give it its due chance. it’s ok so far but the faq/how to play is incredibly lacking… has potential though..
Great game, very good comunity. I really like it so far, friendly community and interesting game mechanics. Awesome! Needs a better tutorial though, lol. So far the game is okay, it’s not bad really. It has this oldschool rpg feel to it and even has some oldschool rpg music to go along with it as well. Click play music down at the bottom and enjoy! Tolles spiel im Retro Style mit wirklich interessierten Entwicklern und Mods die ihr möglichstes geben zu helfen und zu unterstützen. Ich hoffe auf viele weitere Spieler die dazu kommen werden. Cool, hoping it develops more. Very good game, similar to final fantasy! Very fun game if you can get over the graphics and different mechanics.